Teens, alone on an island, unearthing malevolent spirits. Beers and bonfires on the beach, and a dramatic game of Truth or Dare. Ghostly voices over the radio, and an abandoned military base with a secret. These are the potent ingredients of Oxenfree, a sharp, spooky new adventure game that you should totally check out. That premise makes Oxenfree seem like a clichéd thriller, but these high schoolers aren’t just murder-fodder. They’re well developed, believable characters, with the sort of complicated inner lives that you don’t often see in media, especially in horror. Oxenfree’s characters are constantly chatting, and you have to pick Alex’s responses with the sort of speed you’d expect from a real-life conversation. There are no pauses in Oxenfree. Banter bounces quickly from character to character, and if you don’t chime in quickly enough, the conversation moves on without you. If you say something in the middle of someone else’s sentence, Alex will interrupt it and change the flow of the conversation. And if you don’t say anything, people notice and react to that, too. That may sound similar to the sorts of dialogue featured in games from Telltale and BioWare, but it’s actually way more sophisticated than that. The speed of it all is what sets Oxenfree apart. While it can be frustrating in its realism—you don’t have time to deliberate over what to say, as you would in most games—it also flows really, really well. It’s helped by good writing and strong, naturalistic voiceover performances. You can expect ums, uhhs, incomplete sentences, thoughts that trail off and don’t lead anywhere in particular—all of the messy stuff that happens when you’re actually speaking with other human beings. The implementation could have been annoying, but instead this attention to detail gives Oxenfree’s dialogue—and by extension its characters—a lot of depth and texture. All of the writing is anchored by a handful of stellar performances delivered by the game’s voice cast, which includes Telltale veterans Evin Yvette and Gavin Hammon. The actors are so good that I found myself caring about even the bitchiest, surliest teens in the game. Considering how easy it is to hate on teens—particularly teens in the often thankless horror genre—this feels like a big accomplishment. As Alex and her friends explore the island, you’ll find spots where you can pull out Alex’s radio and tune in to otherworldly frequencies. That’s where the supernatural scares come in, as the frequencies Alex finds all hint at a dark, twisted island history that had remained hidden for decades. Ostensibly, the game is about taming that supernatural force, saving your friends, and finding out the truth about what really happened on Edwards Island. But like the best horror, that stock setup is an excuse to navigate the complicated dynamics inherent to a group of teenage school friends. Consider Alex, your character. She is about to graduate, possibly even leave town. Sometime fairly recently, Alex’s brother Michael tragically died, and she and her friends are still dealing with the fallout. So, not only do you have to constantly field questions about what she wants to do with her life, you also have to deal with the emotional aftershocks that come with losing a loved one in a town where everybody knows everybody. Alex’s parents’ marriage fell apart when her brother died, and her father has recently remarried. She’s joined on the island by Jonas, her brand new step-brother; much of the game involves figuring out their relationship in the wake of the still-fresh tragedy of Michael’s death. Complicating things further, She’s also stuck on that island with the girl that used to date Michael—and she’s not very fond of you. The story doesn’t revolve entirely around Alex, though. Other characters have things going on, like secret crushes, and grudges with one another. 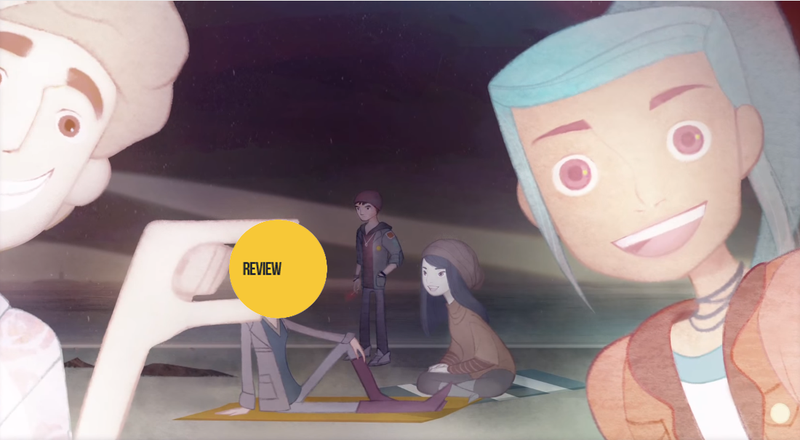 While the horror elements are what grant Oxenfree its narrative urgency, its lifeblood is in balancing the relationships that Alex has with the other five cast members, and in trying to suss out who she really is as a person. I found myself worrying less about whether or not we’d survive the night on the island, and more about what others in the game thought of me. Should I have played that game of Truth or Dare? Was I wise to abstain? Should I have accepted that cigarette, or had a beer from the cooler? Oxenfree nails what it is to be a teen, selfies, “whatevers,” and all. Oxenfree relies largely on Alex’s handheld radio to generate scares; you can bring up the radio with the press of a button, and use it to tune to a number of eerie, ghostly frequencies. At first, the reliance on radio spooks is novel and effective. Thumbing through the frequencies of Edwards Islands makes ordinary numbers stations—creepy enough on their own—seem like Sesame Street in comparison. You never really know what you’re tapping into in Oxenfree—you might wind up listening to de-tuned ragtime piano, or a voice reading an old-timey instruction manual, but it’s all unnerving when it’s devoid of its original context. Radio has an antiquated mystique that is sometimes feels lost in the age of cellphones. There’s a reason hyper-connected devices mysteriously stop working in horror—as the characters’ phones stop working on Edwards Island—and Oxenfree smartly taps into that. At the same time, it can be kind of annoying to go through each radio frequency, one-by-one, trying to find the specific one that will unlock something in the game. Thankfully, Oxenfree doesn’t throw that many puzzles of this kind at the player, and several other puzzles twist the game’s logic around in interesting and confounding ways. Oxenfree’s soundtrack is also damn fantastic. Composed by the electronic musician SCNTFC, the entire thing feels like what you’d get if you crossed the earnestness of Life is Strange with the thick, captivating atmosphere of It Follows, with an added touch of Superbrothers: Sword & Sworcery EP on top. Oxenfree’s story branches depending on the choices you make, and it’s possible to get one of a few different endings. Now that I’ve completed it once, I’m already thinking about my second playthrough—what different decisions will I make? What new mysteries might I uncover? That’s how powerful this game’s sense of intrigue is—I’m invested in finding the optional scraps of backstory hidden in the game, and I want to catch everything that I missed the first time around. Most of all, though, I want to see what happens if I ask different questions during Truth or Dare.